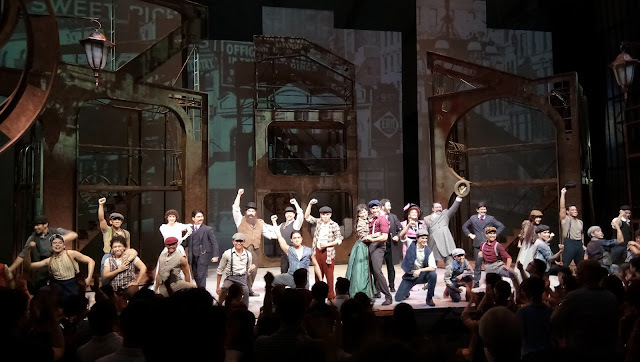 After its opening week, the gala premiere strike the Globe Iconic Store Bonifacio High Street Amphitheater in Bonifacio Global City by storm with a thrilling and intensifying stage debut performance of the 21 motley crew of Newsies. The original film version in 1992 was a flopped but later became commercially and critically successful when a stage version premiered on Broadway in 2012. Set in 1899, Newsies tells the story of the real-life newsboy in New York City. Creative Marketing and Multimedia Business Senior Adviser and Executive Producer of Globe LIVE, Joe Caliro made an opening statement with so much emphasis and excitement what to expect from Newsies. He was in ecstatic to introduce Felipe Gamba, Director of International Production Strategy, Disney Theatrical Group (DTG), who flew directly from the US to catch the gala performance. I knew nothing about Newsies except that I watched some video clips just like what I did with Sister Act. I didn't even sit on the couch just to watch the film version of both Newsies and Sister Act. One thing that pierced on my mind upon watching Newsies clips from the Original Broadway Production was the signature dance routine, variation and genre of this period musical. Disney Theatrical strictly and specifically asked the local production team not to mimic everything from sets, blocking and choreography and that the music and lyrics will not be changed. The 6 hour a day for 6 weeks Training Ground for triple threat started as early as April, choreographed by PJ Rebullida and directed by Robbie Guevarra was the answer by 9 Works Theatrical to that grueling challenge and demand by this piece of Disney Theatrical. As the fansies flanked and flocked the amphitheater, the rain started to fall when the show was about to start and heavily poured as the show progressed. Attending the press launch and watching the gala from a very good sightlines was an invitation and savoring a 7 - course meal from Ibiza Beach Club and chilling cocktail from Stella and Rocket Room was a special compliment. Upon entering the house, I was greeted by five moving and revolving sets by Ed Lacson, complemented by multiple videos and projected sceneries by GA Fallarme and lighting radiantly and vibrantly pleasing to set my mood by Martin Esteva. Costume designed by Eric Pineda added realistic impression and interpretation of this all Filipino cast and creative production of Newsies. The book of Harvey Fierstein, music of Tony and Oscar winner Alan Menken and lyrics of Jack Feldman was soothingly directed by Daniel Bartolome. Tremendous credits goes to award winning Gawad Buhay choreographer of American Idiot PJ Rebullida. From the start, my expectation is soaring high how his bodily expression and execution of the quality and form of this masterpiece will be effective, affective, expressive and communicative through dance. Combination of neophytes and veterans thespians danced through jazz, contemporary, ballet, gymnastics, acrobatics and tap. Whether if it's a regular versus simultaneous and starting versus ending canon movements these actors swayed and swinged. The dynamics were also evident from direct or indirect space, sudden and sustained time, light or strong weight and the flow whether free, bound or continuous. From high level of jumping, tiptoeing and standing, middle level of sitting and kneeling and low level of cringing, rolling and lying the improvisation and inversion were outstanding and amazing. The space and stance created during the variation of pas de bourree, pas de chat and pirouette was beautifully executed leaving the full house in awe. 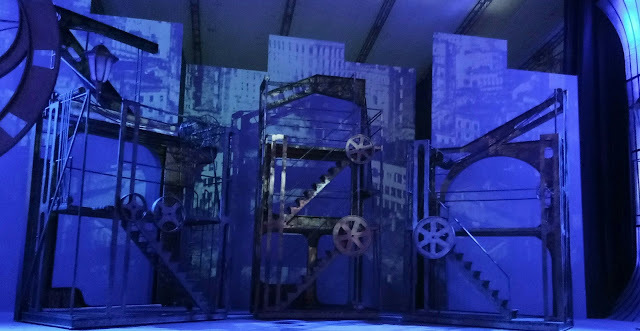 The wonderful stage design of Newsies. The highlight of the show happened at the beginning of Act 2 where the newsies tapped to dance and that scene received the loudest cheers and thunderous applause from fansies. 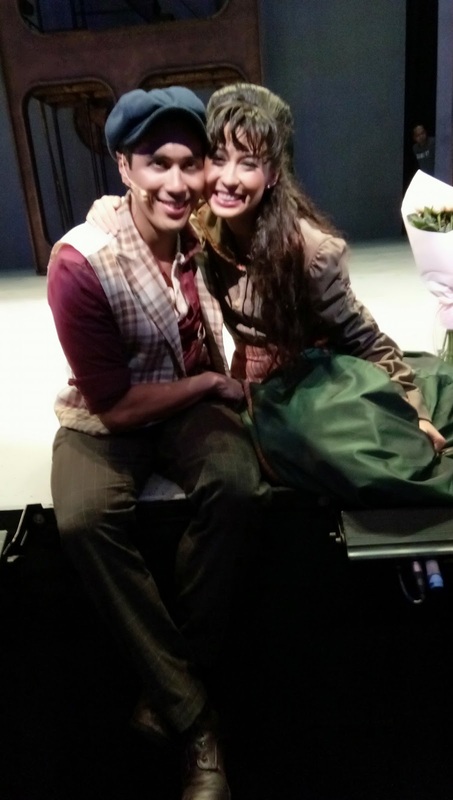 Filipinos are not used to tap dance and thanks to Yek Barlongay for the additional choreography on tap. The concentration, communication and cooperation of the boys created a rhythm that resulted a unison remarkable performance of the night. This production was the first directorial job of Robbie Guevarra that I saw, I knew him as a seasoned and veteran actor. Mounting a Disney show and putting all these actors onstage is a creative and collaborative process. And he made an extraordinary job in motivating and blocking these boys with so much stress and weight. An effective director indeed. Gian Magdangal as Jack Kelly, and Danielle Chopin as Katherine Plumber. Gian Magdangal made an impressive comeback in this production. Worthy of a standing ovation from the house, myself included. His 11 o'clock musical signature soliloquy was emotionally satisfying and breathtaking. 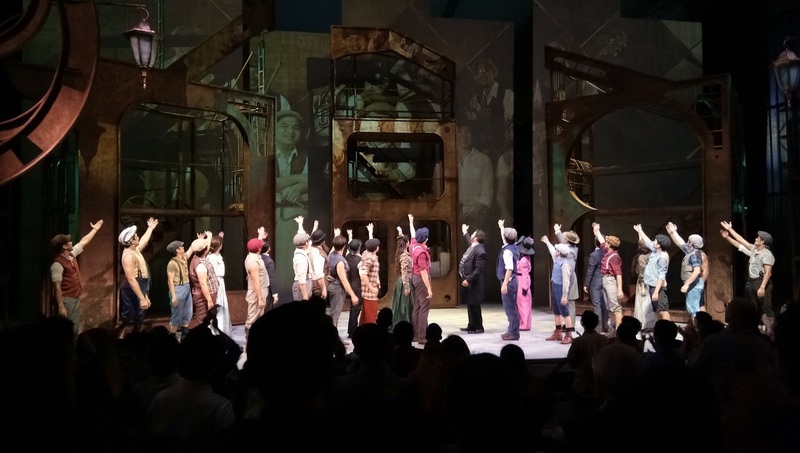 Newsies made a striking Philippine stage debut. And its continuous successful run is still making headlines in theater fans. This musical is highly recommended for all ages. Leading the cast are Gian Magdangal as Jack Kelly, Danielle Chopin as Katherine Plumber, Jef Flores as Davey, Daniel Drilon and Tory Cortez as Les, Luis Marcelo as Crutchie, Greg Dulcie as Joseph Pulitzer, Pinky Marquez as Medda Larkin, Raymund Concepcion as Teddy Roosevelt and Nunzio, Ariel Reonal as Wiesel, Mr. Jacobi and the Mayor, Franz Imperial as Snyder, Alex Diaz as one of the Newsies and Joni Galeste and Melissa Bell as Bowery Beauties. Supporting cast are Anton Posadas, Ian Ocampo, Erick Arenas, Stephen Viñas, Ronelson Yadao, Jim Ferrer, Jordan Bartolome, Mark Anthony Grantos, Chesko Rodriguez, Jon Abella, Kendrick Evasco, Vyen Villanueva, Jan Mayo MC dela Cruz and Clark dela Riva. Catch Disney's Newsies final week from July 28 - 30 at 8pm, playing at Globe Iconic Store Bonifacio High Street Amphitheater in Bonifacio Global City. For tickets, go to go.globe.com.ph/newsies or www.ticketworld.com.ph or call them at 891-9999. Newsies is co-produced and co-presented by Globe Live and 9 Works Theatrical with special arrangement from Music Theatre International (MTI). Also presented by Mossimo, Bonifacio High Street, RX93. 1, StarWorld, FOX and MAC Cosmetics, official make-up partner.